Osprey is calling you home to yourSelf. God is always communicating with you and lovingly guiding you. Are you listening? More importantly, can you hear God’s guidance clearly? Or have you forgotten how to be still and go within? I am so blessed to be aligned with Source and to have a life that flows with ease and grace. How are you doing? Are you going against the current? Or is your life flowing smoothly and gracefully? Are you resisting or allowing? Are you in place of fear or love? Are you connected to your ego or God? Take a look at your life and you will know by how you feel and the evidence around you. As I mentioned before, fear is always evidence of your ego running the show. Love is evidence that you are aligned with God, with Divine will. Let me share 2 sweet moments with you to better illustrate this to you. Yesterday I was connecting with my dear friend Terra on Facebook who is currently living in Costa Rica but who was nearby in Edmonton. In my heart, I longed to go and see her. I live at the edge of Amisk Lake in the middle of the boreal forest, 2 hours north of Edmonton. For many years now and more consistently this last year since I began living by the lake, I have been checking in with God before I do anything to make sure that I am aligned with Divine will and not my ego. So I breathed deep into myself, into the place where I am and God is and I knew that I was to stay here at home by the lake and not drive into the city. I could have resisted and ignored what I knew to be truth however history had proven to me that when I go against divine will that lots of struggle shows up in my life as a result (that will be another chapter!). I had been there done that and am no longer willing to live that life anymore. As I was typing the words “It is Divine intended for me to stay here,” and before I had a chance to hit the “post” button on Facebook, osprey flew around 20 meters in front of me, circled, landed on a tree 100 meters away, perched on the tree briefly and then flew north down the lake. I grabbed by camera and captured an obscure shot (included here). As osprey disappeared from view, I heard its piercing familiar whistle like sound calling out to me. I knew that God had just confirmed that I was aligned with Divine will. Ospreys which are a type of fish hawk are often referred to as messengers from God. Ospreys and eagles fly high above the clouds inviting us to have a higher perspective and to listen to our Creator! I have often being blessed with the presence of an osprey or bald eagle immediately after using the words “Divine intended”. Often God speaks to me without words. Sometimes God sends me gentle reminders, often through nature, that seem to invite me to pay attention and to stay open & curious. How is God communicating with you? How is God speaking with you? How is God inviting you to pay attention? How is God calling you home to yourSelf? Can you hear God or are the other critical voices in your head too loud? Slow down, breathe and pay attention. Allow your breath to take you deep into yourSelf, into your essence, deep within you where God dwells. The second sweet moment of connection with God came as I was preparing my morning coffee & enjoying my day of solitude in the sun (as my beloved was away having some guy time with his male friends). I was filled to overflow with gratitude. I was very present. In the next moment, I was aware of a longing to connect with the women in my life. This longing stirred in my heart and I felt myself missing all of my women friends, sister goddesses from the city where I used to live almost 2 years ago. I knew that I would be in the city the next month however I didn’t see how I would be able to see all of the women that I wanted to connect with and complete a few necessary errands when I only had less than 3 days. I had been blessed to be a part of several monthly women’s gatherings when I lived nearer to the city of Edmonton (my friend Nathalie’s Red Tent, a monthly goddess group with my sister goddesses, a women’s Queen group) – all of which offered me deep authentic heartfelt connection & loving support with women. If I tried to see the women whom I was missing, individually, like I had on a previous visit, I would only have time to see a couple of them and I could easily over extend myself and become too busy running around trying to connect. Suddenly God seemed to whisper the idea that I could gather with many women in a group in a park or in someone’s home. As I was feeling how wonderful this would be and realized that I could send out an email or post a message inviting all of the women dear to my heart in Edmonton to join me in gathering as love, something called to me to look up above. Instantly, I lifted my gaze into the sky & witnessed flying above me silently with only a slight sound of air and wind from the wings, a large flock of over 50 large black birds. Within seconds they had disappeared into the distance. Had I not looked up at that exact moment, I would have missed them completely. They were almost as large as geese, with a huge wing span & pure black. They made no honking sound or call. I had never seen a flock of birds fly by so quickly. Their flight was extremely fast and silent. As these auspicious messengers disappeared, I knew that I was to organize a gathering of women. God had whispered. God had confirmed that I had indeed heard correctly. What I didn’t realized until later is that the first gathering would be right here at the lake where I was living that same day with many of the women who lived nearby or who had taken one of my dance classes at the neighboring community center. Dive in and swim where you don’t believe possible. Hours later, I was blessed with 2 more visits from these mysterious black birds (see photo included). 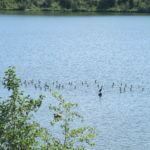 Thanks to my camera, the Birds of Alberta bird book and my bird watcher father, I discovered that I had been visited by cormorants. Cormorants will only come inland to fresh water if the fish are bountiful. 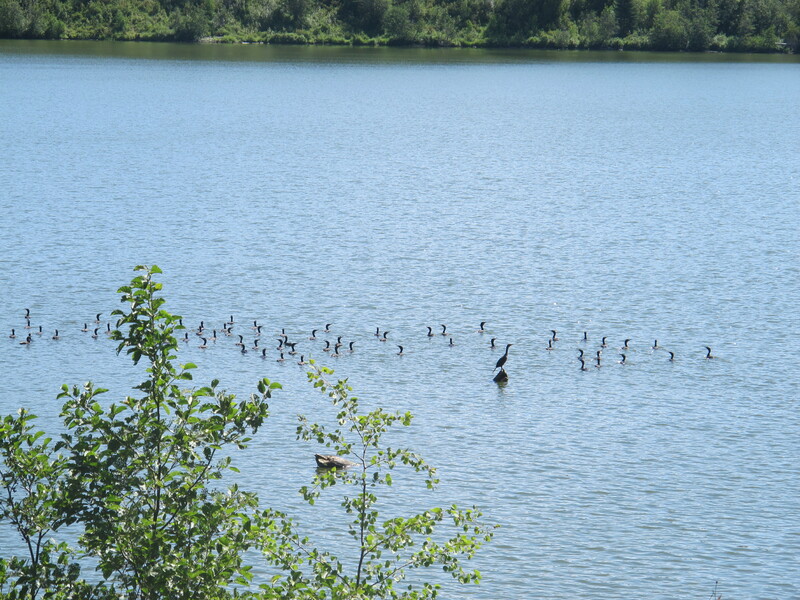 Amisk Lake is a long long distance from the ocean. According to folklore and animal medicine, the cormorant comes as a guide to give encouragement and to wake us up. This animal wisdom speaks of being open to new opportunities, bounty and abundance that await us. The cormorant teaches us to be self-reliant and to use our own wisdom to attain our goals. As a skilled fisher, cormorant teaches us to dive in and swim where we don’t believe possible. It is time to be open to new opportunities that will present themselves and allow us to experience and accomplish what we didn’t think was even possible. When God guides me to do something I take immediate action. Within an hour I had contacted several women in the area, inviting them to a “Monthly Dosage of Love” gathering that same evening. Five women blessed me with their presence that evening! During our gathering, God spoke thru me and announced that we would be gathering next month again and each month subsequently for a women’s “Monthly Dosage of Love” here by the lake. All present were in agreement & deeply grateful that they would be able to count on this monthly gathering for support and deep connection. For me, I knew that this gathering would provide me an opportunity to serve and to receive. 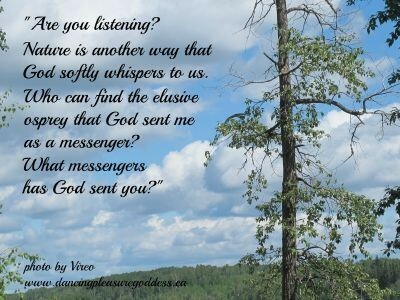 What is God whispering to you? Where is love calling you home to yourSelf? Are you able to hear God’s guidance? Are your fears ruling and frightening you or are you surrendered open as love? Check out my website @ www.dancingpleasuregoddess.ca and email me if I can support you in clearing away fears that are causing struggle and false beliefs of separation. Let me guide you in identifying and clearing whatever is blocking you from feeling connected to Source. I trust if it is Divine intended for me to serve & support you that you will contact me.